The unofficial start to sizzling summer fun is just a few days away – Memorial Day 2015 lands on Monday, May 25 and eBay is ready to help you and your visitors celebrate with tons of great deals across many of our popular categories. Encourage your visitors to check out our Memorial Day Event deals page where they’ll have access to everything they need to kick their summer off. For those looking to revamp their bedrooms, bedding and mattresses are up to 60% off until May 25. eBay has everything from pillows, sheets, mattress pads and toppers to comforters and duvet cover sets. Headboards, bed frames and colorful blankets and throws are also on sale. Whether you have a twin, full, queen or king, we have you covered with tons of bedding options. Starting today until May 26, you can help your visitors score big savings in the tech department. eBay is offering up to 50% off the hottest gadgets including laptops, tablets and TVs. Those planning summer vacations could use some headphones for long trips and a camera to document their adventures. Anyone planning to hang at home may enjoy new speakers or a game console. eBay is kicking off summer in style with name brand fashion and accessories on sale until May 26. Popular apparel and health and beauty products are just under $50. In addition, we’re offering deep discounts on accessories with handbags up to 40% off and shoes up to 50% off. There are even more savings on watches and jewelry – add a little bling to your collection with watches up to 75% off and jewelry up to 90% off. Whether your visitors are looking to grab some gadgets or want to revamp their bedrooms or their closets, eBay has you covered. 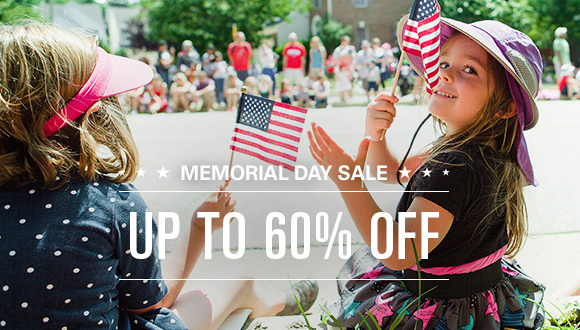 Hurry, these Memorial Day savings won’t last long!